Hello, today I’m doing a Citizen AW1410-08E review, this is another watch from their eco drive range which I’m focusing on for the next couple of weeks. Recently I highlighted their 8 best eco drive watches under £200, if you get a moment do check it out and see what’s available. Those who come here regularly will know I love Citizen’s eco-drive range. I have a few of these in my collection and find the tech pretty impressive. 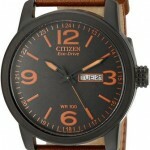 Overall this watch is easy to read with large numerals and luminous hands making it easy to read in dim lit conditions. I think the black cloth strap is a bit different so will be interesting to take a look at too. Anyway let’s take a proper look at the parts that come together with this watch. As I had hoped for they’ve gone for a mineral glass. Out of the 3 most common glasses (Acrylic, Mineral, and Sapphire) this is the more common you would expect around this price. Sapphire is usually found on much more expensive watches as it’s one of the best protections you can have. However mineral is still very good and is specially hardened to prevent scratches. The main thing you want to avoid is acrylic in my opinion as it’s really not that great. Looking into the size details we see that the diameter of the casing is 44mm, this is classed as a large watch. The thickness however is 13mm which is a standard size. I’m happy with the case size as I like my watches to be at least 42mm which is the typical starting size you find from a lot of men’s watches these days. 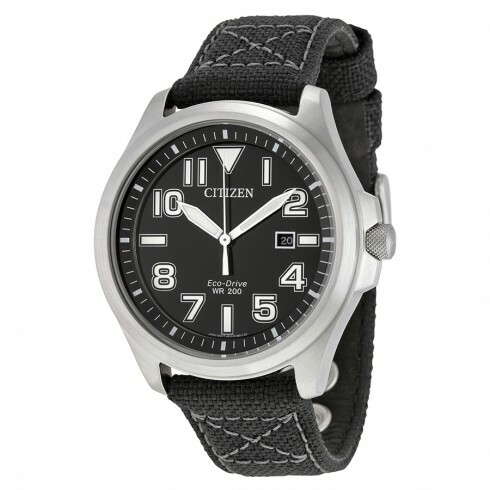 This Citizen AW1410-08E features a standard date display. I think I may have considered dropping the date display all together and just keeping a cleaner look to the dial but that’s just my thoughts on it. How about you? 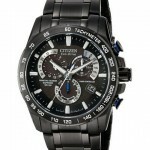 So this is another one of Citizen’s EcoDrive watches. These watches power themselves via sunlight. Once fully charged they can last anywhere from 45 days up to a total of 5 years without being recharged. Also once your watch does start to run out of power, instead of losing time the watch will start to tick every two seconds to indicate this to you. No time lost! This brings me nicely onto my next point. The watch strap is made of a black canvas cloth which is 20mm wide in keeping with the rest of the size of the watch. They’ve decided to go for a standard buckle clasp which is most common for this type of strap. It’s pretty simple with no bells and whistles but does the job. Time to finish off my Citizen AW1410-08E review. It’s been quite fun looking at this watch, not normally something I would personally go for but felt I would review it for the site as I know a lot of other people love the Citizen range and especially prefer simpler watches with less busy dials. 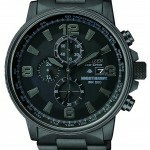 This is an easy to read watch that sits very comfortably on the wrist. What do you think of it? Let me know in the comments below. Hope you enjoyed my Citizen AW1410-08E review. You can buy this watch on Amazon.